This looks like the most perfect set up to host a dinner party with all my favorite blogger friends. Want to join me? Just as soon as I have more then a city back alley to set up a table in, you are all invited over. In the meantime I'm guest posting for Helena at A Diary of Lovely today. Here is a sneak peek of what I wrote about. Don't forget to get your entry in for the Pillows Giveaway - you have till Sunday night to comment, blog, tweet, etc. to get those extra entries in! Have a lovely weekend and yes I WOULD love to join you. Count me in!! Have a great weekend! Would LOVE to join in!! Did you set out the veggies at the end for me? Nobody else has any near their plate? Yes Carlee, those are for you! Oh I can't wait to come! what will i bring? or are we having frozen burritos??? Looks fun, count me in. Now I am off to check out your guest post! Amazing - looks like it would be loads of fun!! Great guest post today. I loved it! Yes, please! I'll bring something yummy to fill those glasses. Hope you're having a good weekend, Linds! I always send my RSVP's back on time, so YES, count me in. In the meantime, I am off to visit with Lovely. yes please! 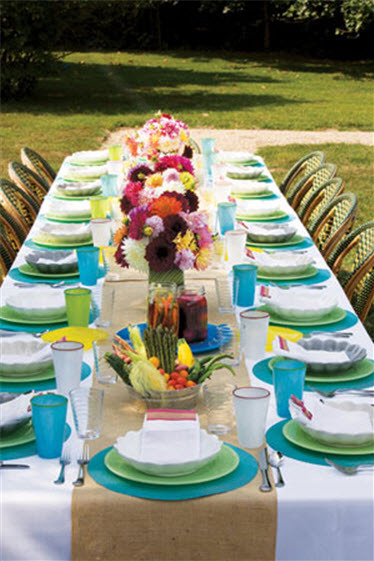 love the look of that outdoor dinner party. love that table! We should have a Boston Blogger meet up! I have a few outside places in mind where we could set a table like this! I'm in - especially if the table looks anything like that!